Aliaune Damala Bouga Time Puru Nacka Lu Lu Lu Badara Akon Thiam (born April 16, 1973), better known as simply Akon (pronounced /ˈeɪkɒn/), is a Senegalese-American R&B recording artist and songwriter. 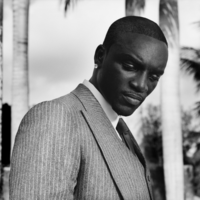 According to Forbes Akon grossed $21 million in 2010, $20 million in 2009 and $12 million in 2008. He rose to prominence in 2004 following the release of "Locked Up", the first single from his debut album Trouble. His second album, Konvicted, earned him a Grammy Award nomination of the single "Smack That". He has since founded two record labels, Konvict Muzik and Kon Live Distribution. Akon often sings hooks for other artists and is currently credited with over 300 guest appearances and 45 Billboard Hot 100 songs. He has worked with numerous performers such as Michael Jackson, R. Kelly, Quincy Jones, Eminem and Whitney Houston. He is the first solo artist to hold both the number one and two spots simultaneously on the Billboard Hot 100 charts twice. He has had 6 Grammy Awards nominations and has produced many hits for artists such as Lady Gaga, Colby O'Donis and Leona Lewis. Lady Gaga and T-Pain are two artists who were given their chance at fame by Akon. He has also released a song called "Beautiful" featuring Colby O'Donis and Kardinal Offishall which is in his hit album named Freedom which he released in 2008 and also "Right Now (Na Na Na)" in the same album.